I must admit, a play about the friendship between a farmer and the local vet doesn't exactly sound like an edge-of-your-seat thrillride. But then this is Theatre 503 - they could advertise watching paint dry and it'd be a fascinating evening. So expectations were high for And Then Come The Nightjars, especially as it's the winner of the first Theatre 503 Playwriting Award, spending a month on the London fringe before a transfer to the Bristol Old Vic. 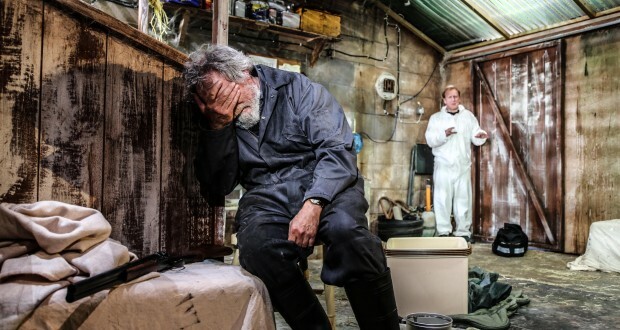 Set in rural South Devon, the play chronicles the relationship between two men over 12 years. Michael (David Fielder) is the Platonic ideal of the west country farmer. Marvellously bBearded, gruff, practical to a fault and utterly sure of this place in the world, he fits the farmland setting perfectly. Following the death of his wife Sheila, he's devoted himself to his prize-winning herd of cows, each named after members of the Royal Family. In the opening scene, one of them is calving: he looks with the nervous tension of a father-to-be in a hospital corridor. Assisting him is Jeff (Nigel Hastings). He's a middle-class professional, more effete than the farmers he assists but respected for his veterinary skills. Michael and Jeff jokily pass the time with one another, nervously alluding to dark tidings on the horizon. This proves to be the beginnings of the Foot and Mouth epidemic that carved a bloody swathe across rural Britain, necessitating the destruction of tens of thousands of cows. Later that year, an already traumatised Jeff has been tasked with killing all of Michael's cows. Michael is despondent, angry and desperate, scrabbling around for some get-out clause and pleading with Jeff not to murder 'his girls'. Yet it must be done, their friendship becoming poisoned by pyres of smoking bone and sizzling grease. Is it possible to forgive after this? A contemporary rural setting is a rare sight on stage. Firstly, playwrights tend to both live in and write about cities (as, well, that's where theatres are), combined with the obvious difficulties in recreating the great British countryside in a room above a Battersea pub. But the moment you see Max Dorey's outstanding set, the thrum of metropolitan life recedes into the distance. As someone who largely grew up in the countryside, the attention to detail was stunning; from the power extension cords snaking around the breezeblock walls to the dirt marks on the wooden beams to (in a seriously brilliant touch) the dots of moss collecting in the grooves of the corrugated plastic roof; this is an deeply evocative bit of set design. It's aided by Sally Ferguson's excellent lighting scheme that conjuries up the world beyond. Various forms of sunlight illuminate the room, slatted rays shining through the beams or the gentle orange-pink sunrise streaming in through an open door. In more dramatic moments, everything else cuts out to leave the harsh orange of flickering flames, underlined by the hiss and crackle of burning flesh. This technical and artistic precision makes for a rock solid performative scaffolding. Both David Fielder and Nigel Hastings are outstanding in their roles, effortlessly involving us in the fears, joys and sadness of their characters. Fielder that stands out, imbuing Michael with hilariously rough-hewn sturdiness. As we progress to the point where his beloved cows are scheduled for destruction, his gruff masculinity slipping away as he pleads for their lives. It's heartbreaking - Fielder achieves emotional rawness that I genuinely straight-up cared about the welfare of these imaginary, off-stage cows. This is a scarily intense sequence, yet more restrained delights follow, culminating in a touching paean to an undisturbed, quiet rural life. Hastings has a slightly trickier job. Nigel has to be broken down and reconstituted, with the trickiest bit playing him concussed, drunken and blood-smeared without dipping too far into slapstick. He achieves this with gusto, physically embodying every aspect of drunkenness (a highpoint being a disturbingly realistic portrayal of a guy about to puke all over himself). By the time the curtain falls the two actors have intertwined around one other, each equally supporting the other. I'd never seen a Bea Roberts play prior to this, but by this standard she's clearly an outstanding writer. And Then Come The Nightjars is a play with scope: one moment a knockaround comedy double act, the next a traumatising psychodrama, even (for a brief moment) a soft-shoe-shuffle vaudeville number. Despite this tonal range, the core drama is solidly locked down, the shifting relationship between these two men utterly compelling. It's this level of all-around quality that fringe theatre should aspire to; focussing on nuanced performances and intelligent staging rather than heaping ladles of razzle-dazzle. This is Theatre 503's carefully staked out territory, and as someone who sees an awful lot of fringe theatre, they've once again reminded me why they're the best in town. And Then Come The Nightjars is quite brilliant. Whether in London or Bristol - go! And Then Come The Nightjars runs at Theatre 503 until 26 September, and then at the Bristol Old Vic from 6 - 17 October 2015.